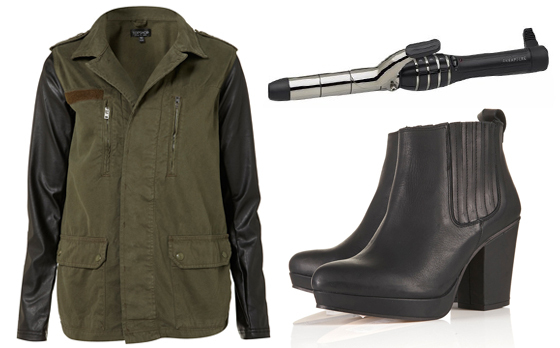 Autumn must haves, since I saw this army jacket, I kept having dreams about it. As well as I kept on thinking of different ways I could wear it. For the first time in my life I'm so obsessed with an item of clothing. It will be great for Autumn or even now, as the weather isn't great in UK. The boots are great and not too high. I kept on seeing them in the shops, but I never really tried them on. Defiantly will when I see them again. The Curling Wand is another thing that I wanted forever, but never had the funds to buy it, but now it's half price in Argos. I would love to finally own it. that's a sick jacket. amazing find for the fall. love the jacket, I got a fab vintage one for feck all mula, love it!!! Ohh, I'm dying to get my hands on the curling wand, especially since it's now half-price, I can definitely see myself making a bit of an impulse-buy in the near future! such an amazing jacket, I need one!